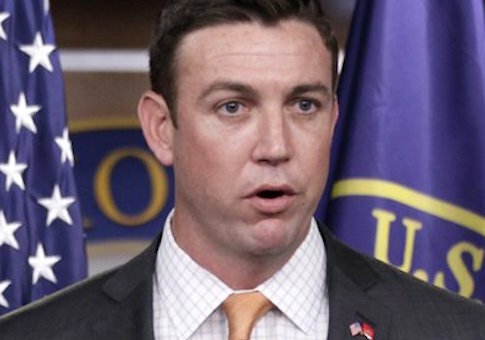 Rep. Duncan Hunter (R., Calif.), a hero, personally removed anti-police artwork from a tunnel that connects the Capitol with a House office building. Hunter removed the piece and personally delivered it to the congressional office of its sponsor, Rep. William Lacy Clay Jr. (D., Mo.). The Washington Post reports that the painting was a part of the annual Congressional Art Competition, which allows high school students to submit artwork to their representatives. Each representative gets to select one work of art, which then hangs for a year in the tunnel between the Capitol and the Cannon House Office Building. The painting depicts a horned animal in a police uniform aiming a gun at a black man, a reference to the police shooting in Ferguson, Missouri. The artist was a high school student from St. Louis, in Clay's district. The work caused an uproar when it was first displayed. Hunter heard other complaints about the piece, including from police and fellow members of Congress. Clay had refused to take the painting down, so Hunter did. According to Hunter's chief of staff, the hero took a screwdriver to the tunnel and took down the painting. He then took the work to Clay's office. So far, it has not been put reinstalled. In response, members of the Capitol Police force have stopped by Hunter's office to thank him. It is not clear if Clay will have the painting returned to the Capitol tunnel. Hunter is a Marine Corps veteran who still serves as a reservist. Clay has never served military or law enforcement. He was in the Missouri legislature before succeeding his father in Congress. Hunter, too, succeeded his father, who ran for president in 2008 and served in the military. This entry was posted in Politics and tagged Duncan Hunter. Bookmark the permalink.